What does a scrappy team of underdogs do after a successful race season? Get bigger, of course. 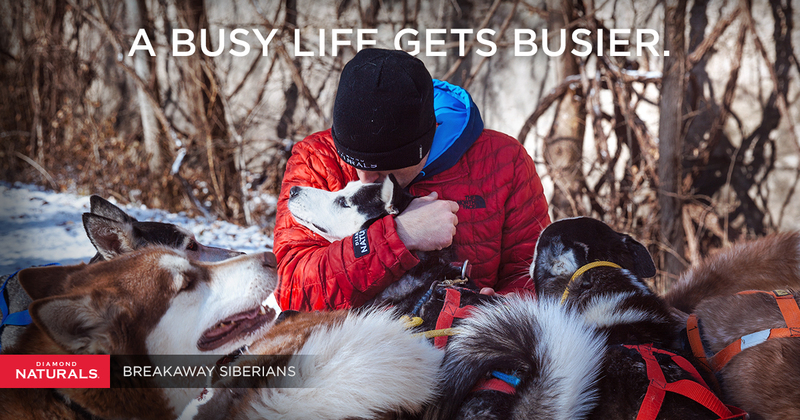 The 2016-2017 race season was an unequivocal success for Richie Camden’s Breakaway Siberians, a Diamond Naturals-sponsored sled dog team made primarily of rescued Siberian huskies who live and train in Missouri. Though a minor injury and some uncooperative weather prevented the Breakaways from reaching their ultimate goal (finishing the 90-mile Midnight Run in Michigan), the team continued its run of improbable progress, finishing the 56-mile IronLine race in Iron County, Michigan, with two six-dog squads. But success means something different to Richie and his dogs. Competing at a higher level is always on Richie’s mind, but providing healthy, happy lives for as many dogs as possible is what matters most. Which is why, even with a baby on the way and a double-digit number of dogs already under his care, Richie adopted two new huskies, adding Juneau and Yashin to the team. With a new racing season on the horizon, watch how Richie and his wife Leah introduce baby Lucca into a busy life with 15 hyper huskies and one bossy Pomeranian as training for the 2018 season begins.